Another TomGeeks art trade, this one for Maya Lindell. While I still definitely have room for improvement on the male form, I'm pretty pleased with how he turned out. 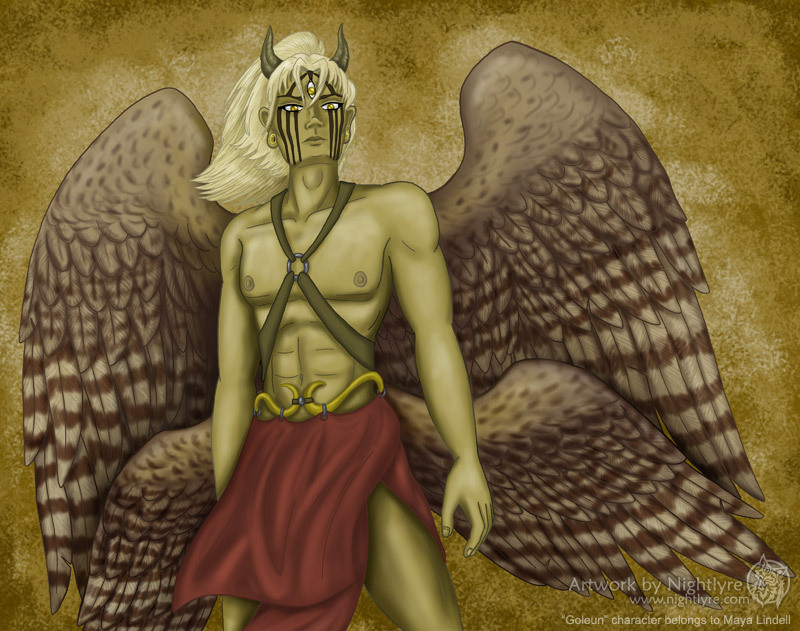 The character is a god from one of Maya's three comics, Kenyagi. 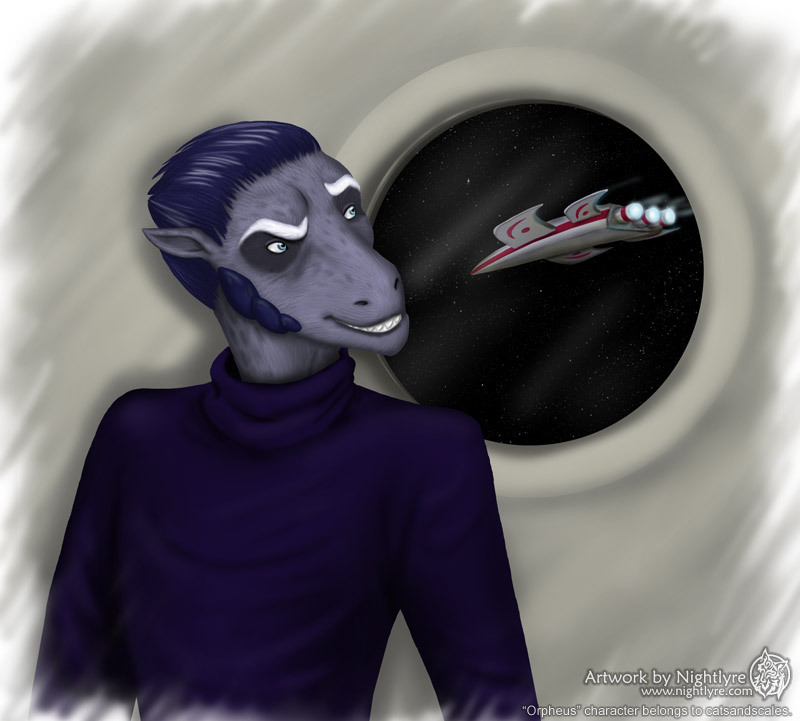 A TomGeeks art trade for catsandscales, of her alien character, Orpheus. 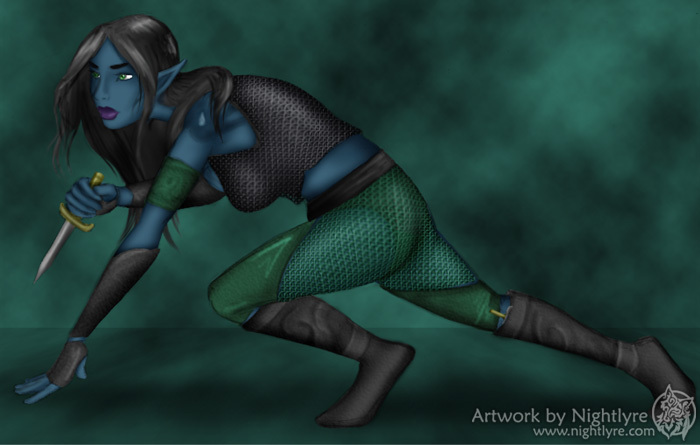 Incidentally, catsandscales' artwork is breathtakingly gorgeous, should you wish to take a look. Another art trade on TomGeeks, this one for Omikuji. 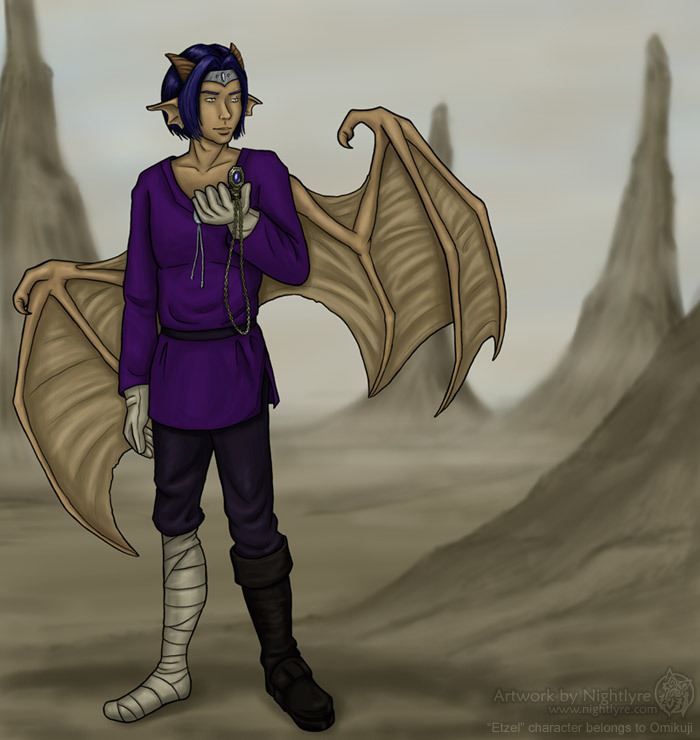 The character is a Ragian, a human-like species with some dragonish characteristics. 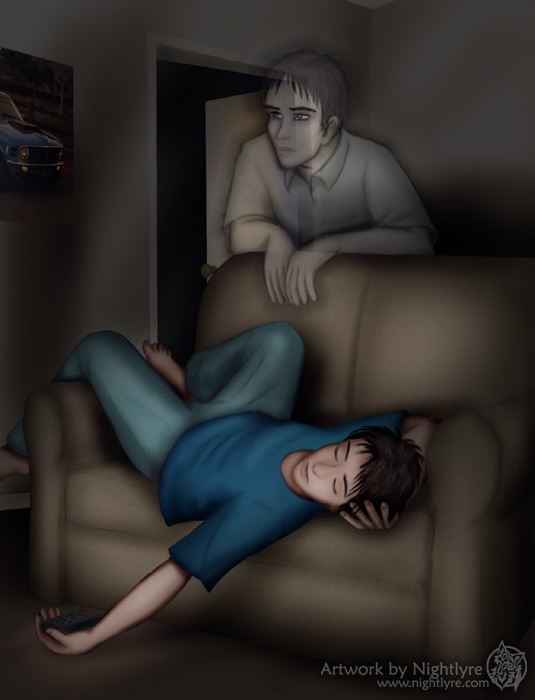 This was an art trade of sorts done for GwSeraph on the TomGeeks forum. Shear's species is a cross between a catlike race and elves, with leopard-like fur patterning. The clothing is a slightly improvised version of how GwSeraph draws Shear. This was a lot of fun, and I hope to do more of these! And backgrounds are evil. This one was another victim of the computer crash, which is a danged shame... I'm really pleased at how this sig turned out. I did at least have a larger version of this one that I had saved off as a color test. 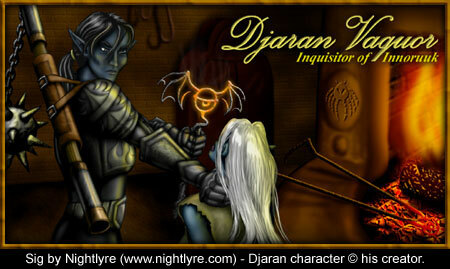 Djaran is an inquisitor (evil cleric) in Everquest II, who liked to ensure that the will of Innoruuk was upheld. I am very lucky that my husband has a good sense of humor! 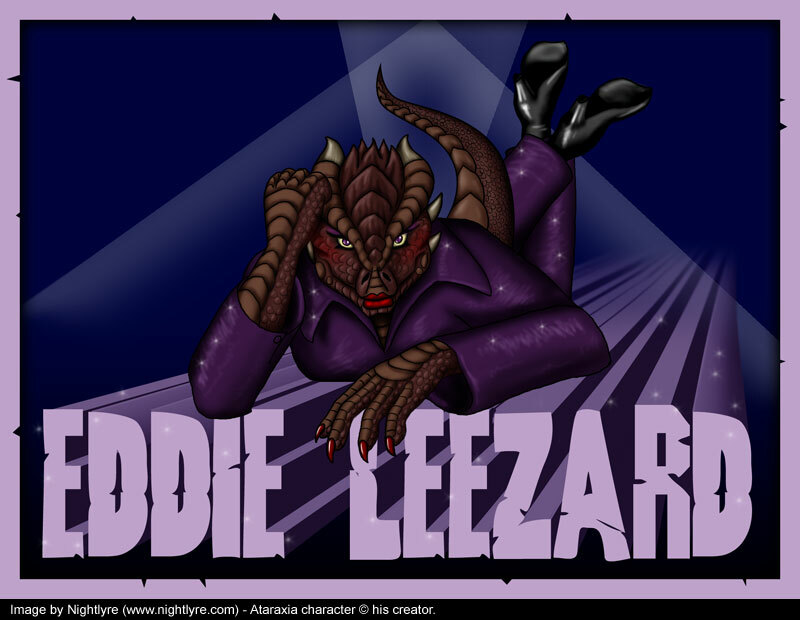 This is his character, Ataraxia (the more reddish Everquest II version), dressed up like the fabulous comedian, Eddie Izzard. This one isn't a sig, it's just for fun. 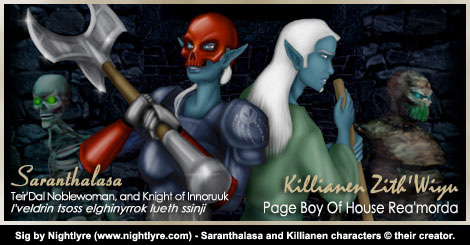 This shadowknight is the Everquest II character of the same player as Saranthalasa and Killianen, below. 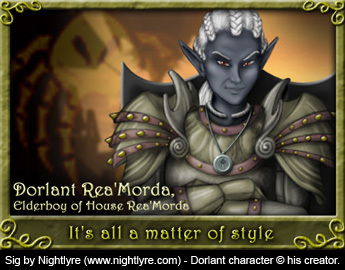 Vain and haughty, he is the son of the Matron of House Rea'Morda. 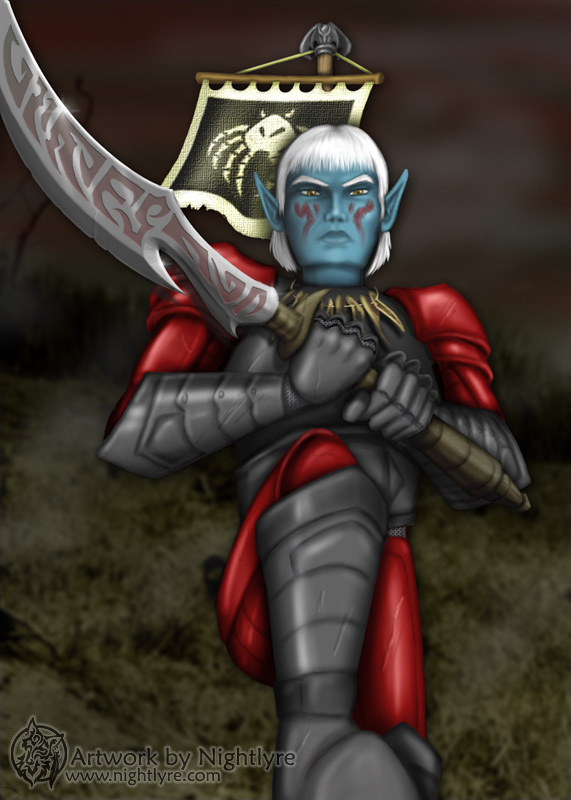 This is the updated version of the sig for my character, the Tier'dal rogue/brigand. Aside from some small details like the snake's scales, I am very happy with how this one turned out. It was because of Zharradan's player that I decided to try out playing an enchanter in Everquest. The class turned out to be a great deal of fun. 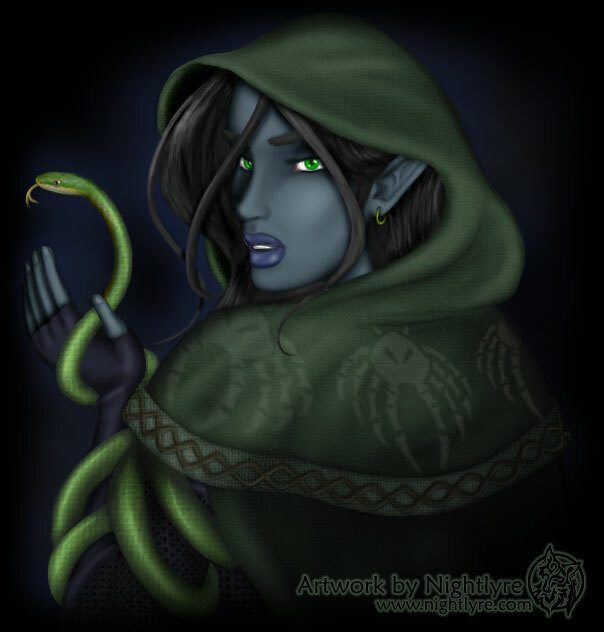 Vemitri was as cold and vicious a Tier'dal as they come, adept at manipulating others to get what she desired. I'm pleased at how the details in this image came out. Resident ranger of House Rea'Morda. We think he may actually be a warrior, but he won't admit to this. Just don't ask him to feign death. 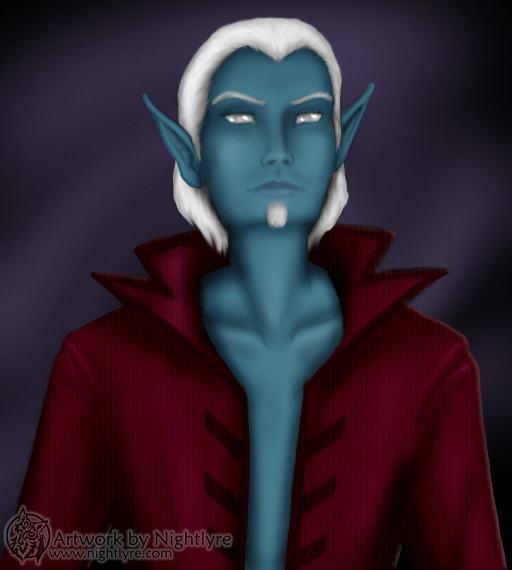 Necromancer, and Patron (depending on whether he's in the favor of the Matron) of the House Rea'Morda, the Everquest guild. 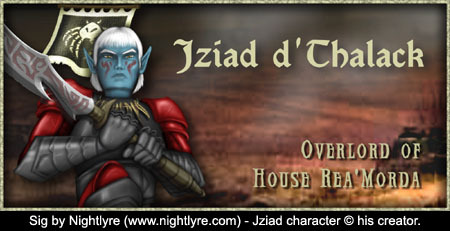 Tier'dal priestess (cleric) and Ilharess of the House Rea'Morda. A lot of detailed work went into this one. 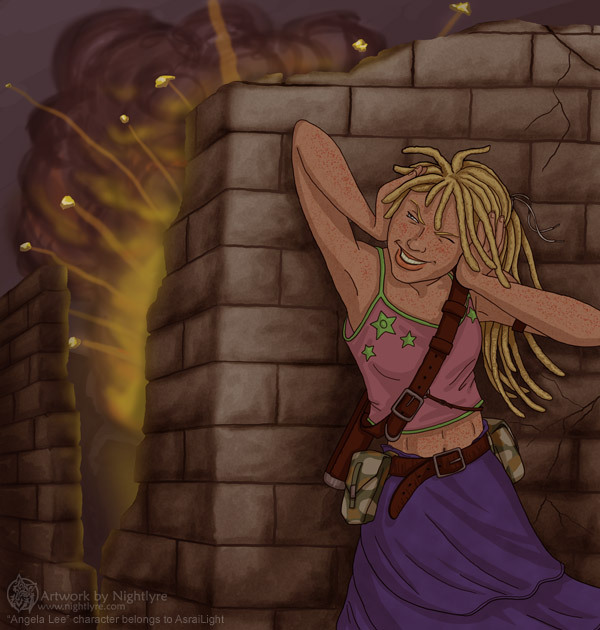 She is the character of the leader of my guild in Everquest. 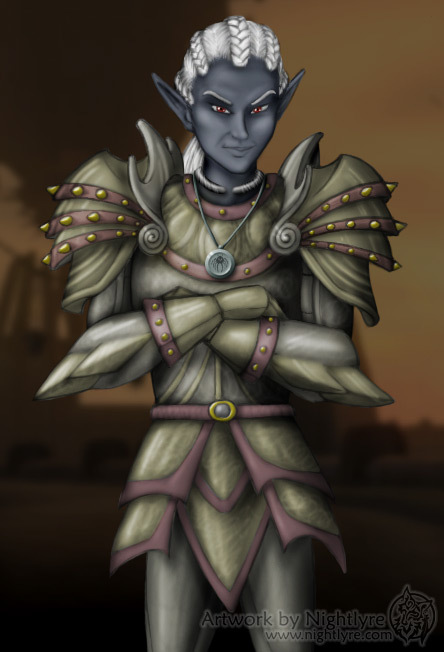 Saranthalasa is a shadowknight and the Weaponmaster of the guild, House Rea'Morda. Killianen is a magician, and more a slave than anything. 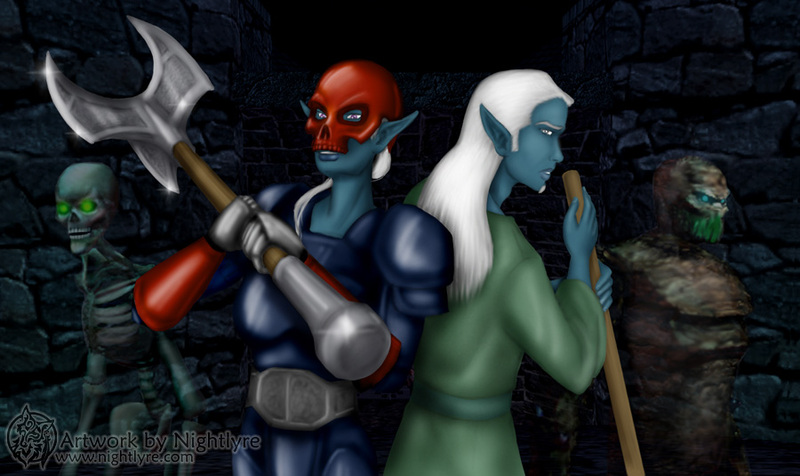 Both are Everquest characters of a friend. An Iksar shaman with an odd habit, which you can probably guess at from his sig file. 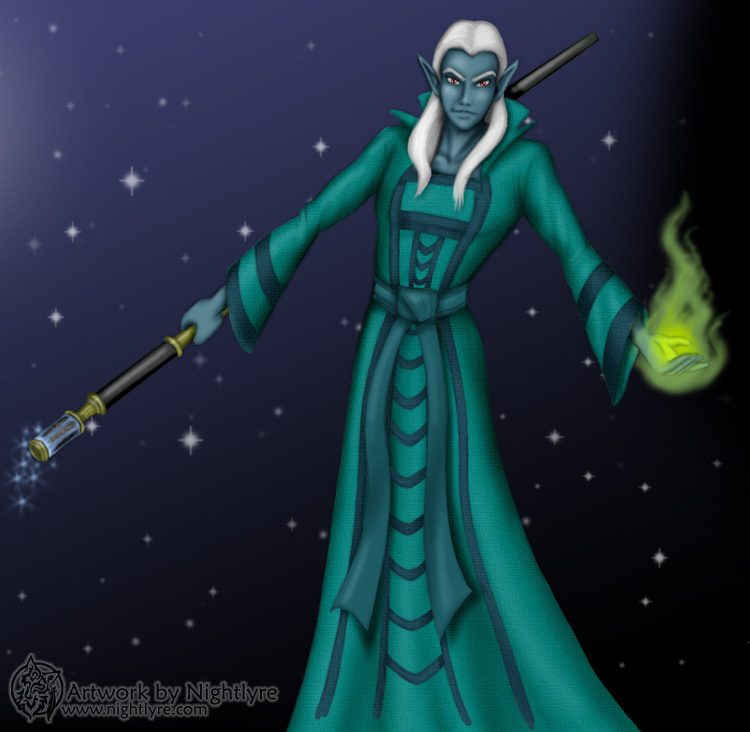 This was one of my husband's Everquest characters. Enchanter and son of the necro below (not the most successful relationship). Only player I know who can pull of such an incredibly creepy and yet mostly innocent character so well. If you want to unnerve Teurelle, mention this psychotic dual-scythe-wielding necromancer, one of the Everquest characters of a friend of mine. This picture is half of the sig above. My main Everquest character. She's a Tier'dal rogue, with a rather... convoluted history. 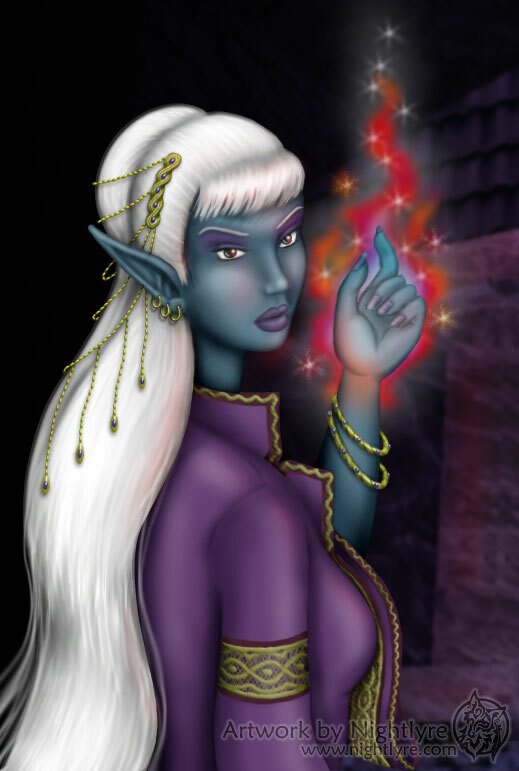 This is one of my Everquest characters, Neranya. 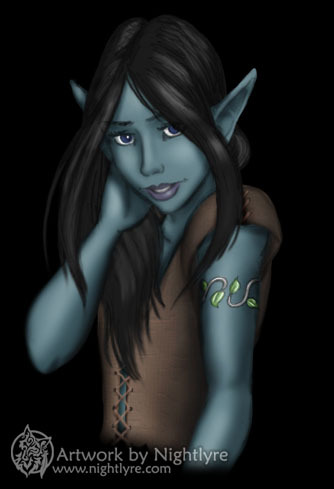 The daughter of my main character, she is half dark elf and half high elf. 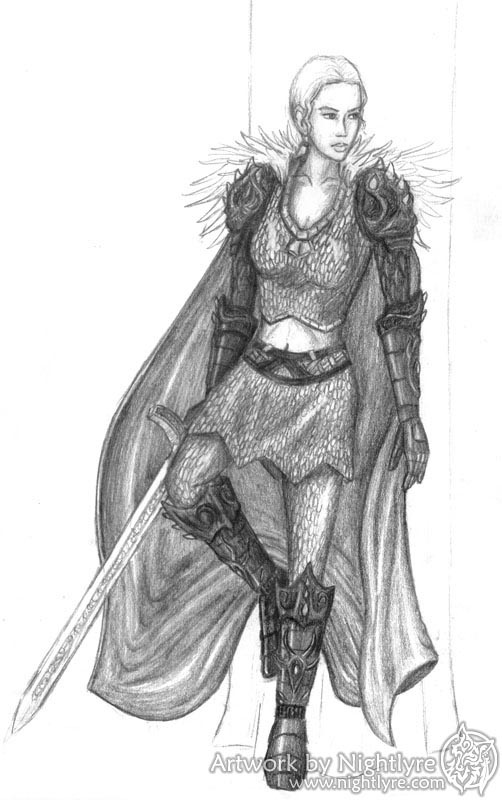 Born with innate necromantic powers, she nonetheless decided to turn away from the gifts Innoruuk gave her from birth and become a cleric. 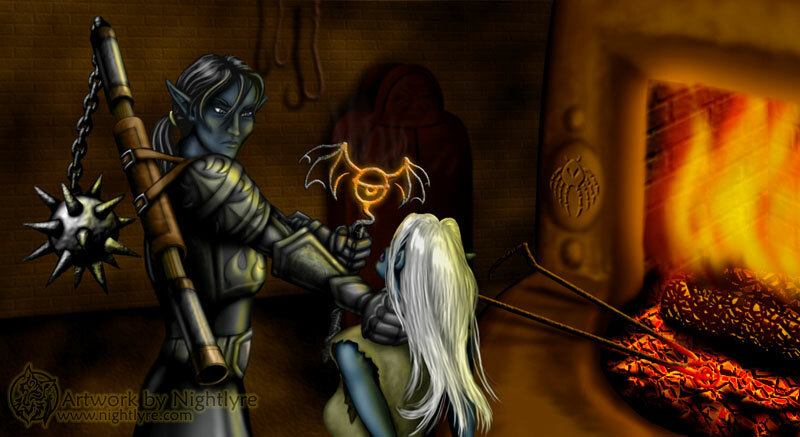 A human shadowknight character in Everquest, played by a friend. I like how this turned out, even though I was only barely learning how to draw armor at the time. 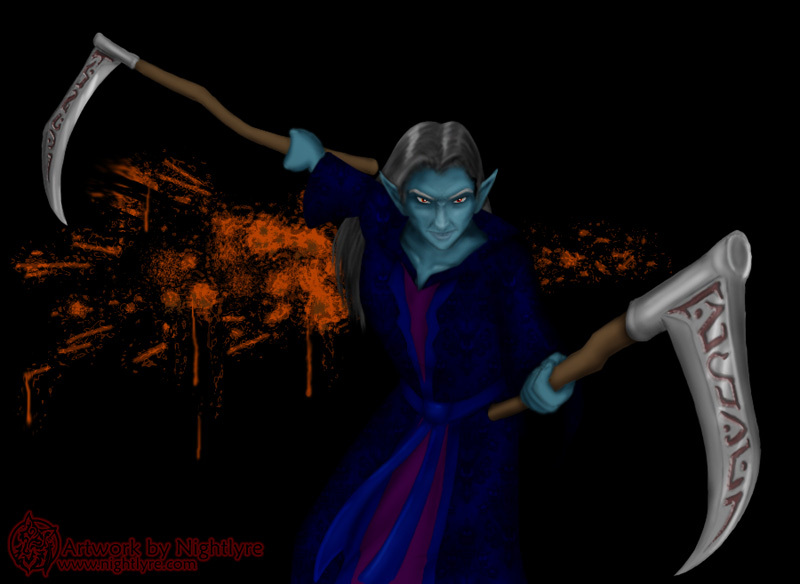 A picture I did of a friend's character in a Vampire RPG, a Lasombra named Ariel. Obviously, she doesn't have the typical Lasombra reflection (or lack thereof); quirks of the character's past. Most of the main characters in a roleplaying game a friend of mine and I used to do. 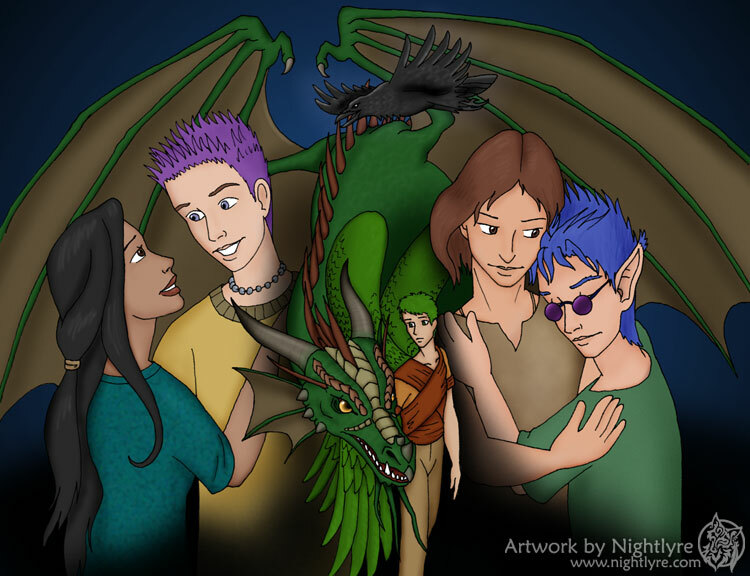 Kisa and Brendan are on the left, the dragon in the center is Jocy, and with the wings is Unell. The raven at the top is Ari, and the two on the right are Gareth and Val. 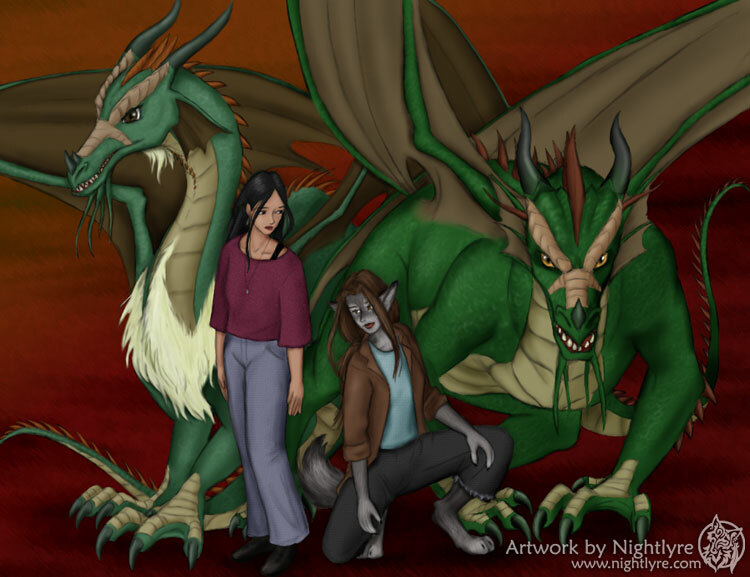 Kisa and Jocy both were shapeshifters, both of which could change into dragons. Jocy also had a wolf form, hence the way she looks. Jocy was one of the first characters I ever fully developed. 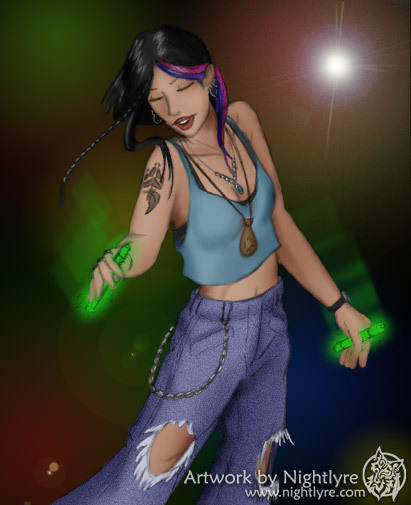 A picture of Kisa when she was younger, at a rave. Here are Brendan and Kisa as furries. Kisa's an ocelot, and Brendan's a raccoon. This was a fun little sub-plot; it was not normal for them to turn into furries. 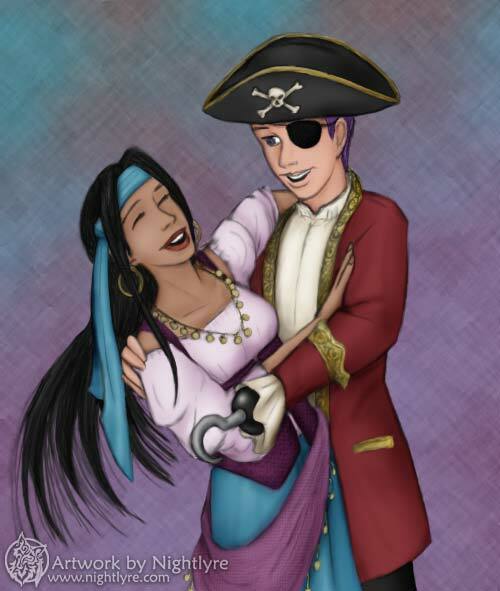 Kisa and Brendan at Halloween, looking positively cute in their costumes. Drawn in pencil, colored in Photoshop. 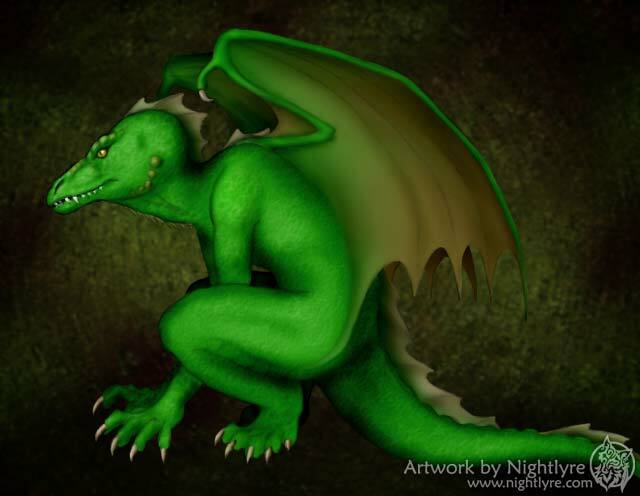 A dragon-like creature named Loki. 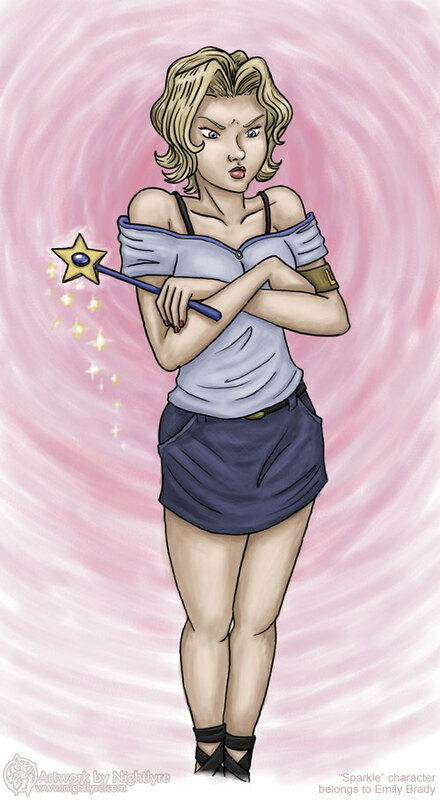 This was one of my first attempts at coloring in Photoshop, and came out pretty nice, I think.